US$ 2215 / person ? 1 Arrival, drive to Thimphu Arrival by plane to Paro airport and 1½ hour drive to Thimphu or in case of arrival by land from India in Phuntsholing/Jaigon and drive to Thimphu. Visit of Tashicho dzong, the castle, which serves as seat of the king and government. If time permits, visit of the other sights. 2 Thimphu Early morning hike to Dodedra shedra. Start at Dechencholing part of Thimphu and gently climb some 500 meters up, with beautiful views of Thimphu town. Dodedra is monastery school set in pristine environment away from the hustle and bustle of the town. Visit main temple with original mural paintings and small museum. Descend back to Thimphu for lunch. Then drive to Buddha Dordenma, the gigantic statue of Buddha overlooking the valley and short walk to striking city viewpoint. See Memorial Chorten, always busy with devotees. Walk in Norzin lam street and see the traffic police signaling in junctions. Thimphu is only capital in the world without the traffic lights. Finish walk at handicraft market where many interesting Bhutanese souvenirs can be seen and bought for reasonable price. Evening in leisure exploring town on your own. 3 Thimphu – Wangdue Morning drive to Dochu-la pass with beautiful 108 stupas. We have good chance to glimpse some snowy peaks to the north, including Gangkhar Punesum (7540m), highest mountain of Bhutan and highest peak never summited by man. Visit to royal chapel Druk Wangyel lhakhang with depictions of 4th king. Form pass we will start 4-5 hours round hike to the Lungchusey gompa with 360° mountains panorama viewpoint. Descend to Tashigang gompa and reaching back to road in Hontsho. Continue drive to Wangdue. Visit to rustic Rinchengang village and lively Bajo town. 4 Wangdue – Gangtey Early morning drive north of the valley and start hike to Khamsum Yulley Namgyal Chorten. The hike start at the riverbank. Walk through the paddy fields and then start steep ascent to the temple. After reaching there, climb up to the temple highest floor to get wonderful views of the valley. After some rest continue hike up to Giligang. Scenic trail offers a lot of beautiful views. Enjoy the picnic lunch after reaching Giligang temple, the 300 hundred year old privately owned monastery. From here start descending down to Changyul bridge. After the hike finish, pay a visti to the Punakha, dzong, one of the most beautiful castles in Bhutan. Continue with short walk to Chhimmy lhakhang temple, devoted to 15th century saint Drukpa Kunley, know as “Divine madman”, who did taught Buddhism by singing, drinking and rampant sexual behavior. Drive to Gangtey and pristine Phobjika valley. 5 Gangtey In the morning will start hike through the beautiful glacial valley with marshland on the bottom. Here the venerated Black Neck Cranes do spend winter. Birds usually stays from November to February. After some 2 hours walk through forest and fields we will reach to Gangtey monastery early in the morning and visit the main chapel. After visiting the temple and early lunch, we will start beautiful 4 hours hike through meadows and forest and crossing the mountain pass will take us to Longtey village where the car will be waiting. Drive back Gangtey and optionally visit Black Neck Crane center. You can make extra walk in the valley or spend time in leisure. You might like to try the hot stone bath, traditional Bhutanese treat (on extra payment, need to be ordered in the morning). 6 Gangtey – Tharpaling Early morning drive to Trongsa over Pele-la pass (3500 m). Stop here to see the shops run by local herders. You can get lot of interesting things here, including the yak wool textiles, dust brush made of yak tail, medicinal plants like puttising root, potent cure for cough and fever or cordyceps dubbed as "himalayan viagra" and energy booster. Continue drive on scenic road with stop at Chendebji chorten which was built to resemble Boudhanath stupa of Kathmandu. Another important stop would be Trongsa viewpoint to see the full extent of the Trongsa castle, which you will visit some more drive afterward. This is the place from where the royal dynasty of Bhutan had risen. Also visit intricate museum in watchtower Ta Dzong. It hosts number of interesting artifacts related to royal dynasty, history of Bhutan and many religious statues and temples. Finally drive to Jakar over Yotong-la pass (3550 m), After descending to to Chummey valley we will again ascend to almost 4000 meters to Tharpaling monastery in which we will spend night. If the weather is good, afternoon hike above the monastery might be good option. Otherwise you can see the monastery chapels and attend monk’s daily chores. 7 Tharpaling – Ngang Hike above the monastery for the views of Jakar valley. 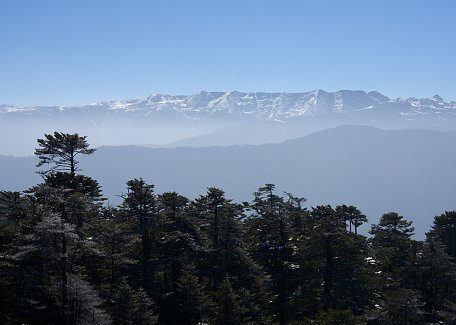 You can even make a detour to higher hill above the monastery from where highest mountain of Bhutan, the Gangkhar Punesum might be visible in clear weather. Continue hike down to Lamey Gompa, where the vehicle will be waiting. First drive to to Jakar dzong, sleepy castle overlooking the valley. After lunch in town we will visit Jampay lhakhang, 7th century temple pinning down the ankle of giant demoness. From here we will take short walk to Kurjey gompa complex, the 3 temples which were built on place where magician-saint Guru Rimpoche subdued local demon. Continue walk along the Choekhor river and finally reaching Ngang lhakhang manor house, stylish farmhouse owned by local nobility where we will spend a night today. 8 Ngang – Tang Today morning we will start hike to Phephe-la pass (3.545 m). All day hike through the forested landscape will ultimately lead us to Tang valley. Here we will sleep in the old manor house Ogyen Choling, which hosts beautiful museum. Setting of the house in the middle of the small village on the hilltop, is also very beautiful. 9 Tang – Jakar Morning drive to Membartso, so called "Burning lake" where Pema Lingpa, the saint of 15th century, discovered treasure of Buddhist scriptures. Continue drive to the Bepzur village and start hiking to Bepzur Chukpo's mansion. From here the ascending footpath will take you up to the ridge with comfortable gently ascending trail. Soon you’ll get uphill and get views of snowy peaks and surrounding hills including of many places you hiked few days back. After about 2.5 hours you should reach Pedseling Gompa, the remote monastery above the Jakar valley. Here also car with picnic lunch will be waiting. Finally we will reach to Bumthang brewry to see the processing of Bhutan's venerable Red Panda beer. We will taste some for sure too! At evening we can optionally visit to dance and karaoke bars to experience local culture. 10 Jakar – Paro (by flight) Taking domestic flight to Paro is extraordinary experience. You will see many of the seven and six thousand meters high mountains on the border with Tibet, including Gangkhar Punesum which counts as the highest mountain never summited by men. After landing in Paro, visit National museum and Paro dzong, castle where Bernardo Bertolucci’s Little Buddha film was shot. Explore the lively small town. 11 Paro Drive to castle-ruins of Drukyel dzong, from where you can see the top of holy Jomolhari mountain. Explore the calm Kyichu lhakhang which also pins down giant demoness body. Climb to Taktsang gomba (Tiger’s Nest), is the highlight of the tour. You can consider hiking in the morning or early afternoon depending on weather and preferences. After visiting the temple, climb further up to Zangto Pelri lhakhang another temple, offering bird’s eye views of Tigers Nest. Include more hikes (+2 days): If you're seeking for some more hiking, then check our Hiking Heart of Bhutan II, 14 days program. Undertake Bumdrak Trek in Paro (+1 day): 2 days / 1 night light trekking with luxury camping near Bumdrak monastery and finish at Tiger's Nest might be interesting optional addition. See Bumdrak Trek & Hikes program for details.